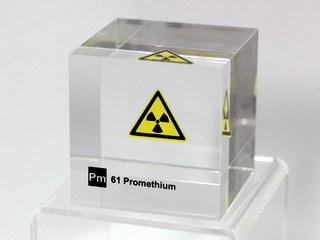 A radioactive element whose longest lived isotope, promethium-145, has a half-life of only 18 years. It is obtained in milligram amounts from nuclear reactors, and a little is used in specialised miniature batteries. Great care is required while handling promethium as a consequence of its radioactivity. Promethium salts luminesce in the dark with a pale blue or greenish glow, due to their high radioactivity. Ion-exchange methods led to the preparation of about 10 g of promethium from atomic reactor fuel processing wastes in early 1963.